Children love telling stories, and these apps will keep them creatively engaged, as well as providing means for assessing and sharing their products. Digital storytelling is a powerful way to engage students in the writing process. 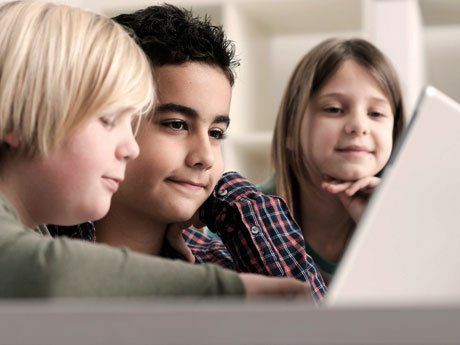 Whether they are telling stories from a summer vacation or writing a persuasive essay on a community issue, technology tools can help motivate reluctant writers. Students can use their writing, audio recordings, video creations, illustrations, and images to create a digital storytelling product that demonstrates their understanding of a concept. Authentic assessments are essential in order for students to develop 21st century skills. Students should be able to create products with a purpose and for an audience. We hear so much about real-world tasks, especially in discussions around Common Core English language arts. Digital storytelling can be used to connect students to local and global audiences, and provide a sense of purpose for their work. When we think of digital storytelling, it is often connected to narrative writing. The idea of students recounting a personal experience or sharing a special moment from their lives can clearly be enhanced with multimedia content. Children might create an interactive book that includes a video reflection or photographs from a field trip. Apps like Book Creator and Book Writer give students of all ages the power to become storytellers. As they explore the other writing types (argumentative and informational), they can also create digital products that transform their writing. Opinion or argument writing can benefit from the multimedia enhancements offered by technology tools. Students can take persuasive essays and create public service announcements, combining videos they've created with Tellagami or ChatterPix into a short clip that supports the argument outlined in their writing. Your elementary school students might use their own voice and add pictures of book covers to give a recommendation, while older students can use video clips and images that support their argument on a community issue. An informative piece of writing, like an ABC book on animal habitats or a step-by-step guide that describes a science experiment, can also benefit from the multimedia features available in a digital storytelling tool. Students can use SnapGuide to include videos and pictures as they describe different steps of a process. Explain Everything is a fantastic screencasting tool that lets students draw on an image like a map or photograph as they point out different features of the animal or ecosystem that they studied for a research report. Digital storytelling products are all about the objective. This objective might be a similar task that you would normally give students with an expectation that they include a certain amount of multimedia in their final product. Depending on their age and ability, you can give them a choice of different apps or web tools, or walk them through one app that you've picked out for this project. All students can benefit from checklists and a rubric aligned to the task. The great thing about digital storytelling products is how easy they are to share. These authentic assessments showing a student's understanding of different writing types and craft skills can be made for a local or global audience. When we think about a local audience, picture something that stays inside a classroom or the walls of a school. You might decide to have students play their video creations for the class or during a celebration that family members have been invited to attend. Students can share eBooks they've created with a younger group of children, or add them to a shared set of iPads that are checked out in your media center or library. Sharing with a global audience can motivate your students to produce something they are truly proud of while demonstrating their mastery of an objective. Many digital storytelling products include "shareable" links to a particular creation that's hosted online. This is true of videos created with Adobe Voice, animated movies made with Toontastic, or screencasts recorded with PixiClip. All of these give you a link to view student creations. With this link, you and your students can share their final products on a class Twitter account, a school Facebook page, or a teacher's blog. Products can be linked to a QR code or augmented reality trigger to be sent home in a district newsletter, or they can be attached to a bulletin board for school visitors. You can even take a student-created ebook and upload it to the iBookstore for anyone to read and enjoy anywhere. Dedicating time to talking about audience, whether local or global, is so important when introducing a task to students. Letting them know who will benefit from their how-to guide, who might listen to their persuasive argument, or who could hear their favorite story will motivate young writers. Make sure to spread the word about your students' great work to other teachers in your school or to the world on social media. Whether the audience is large or small, students will engage in a task when they know who is listening.